Before we delve into the office of the future, lets first touch on the factors driving the change. The most obvious is changing demographics. Millennials are quickly replacing boomers, who by 2020 will represent half the global workforce. Secondly, technology is changing when, where, and how we work. We no longer need to be tied to one place in order to access our files and work. Most people who work in offices can work anywhere they have cell phone service and Wi-Fi. What should owners of office buildings know to make their product attractive to future tenants; and how should those responsible for the selection and design of their company’s office space know to attract and retain top talent? That’s what we’re here to discuss. We are seeing changes in office layout, design, and structure. Here are some of the big ones. Since most white collar jobs can be performed from home or from a coffee shop, building owners and developers will have to change the narrative about what the office means. Since it is no longer necessary, they will have to make them so enjoyable that they recreate a demand for the product. We will be seeing more open and shared space, more ping pong tables, slides, guitars, and foosball tables, tenant lounges, gym’s, yoga, food etc. The office will begin to be looked at as a destination or a privilege, rather than a prison where one is locked in a cube behind a keyboard. It need to be a place where people actually want to go, it’s the best way to keep people happy and productive. The office will be used more for collaboration and less for individual work time. We will see more communal space hoping to improve interaction and the transfer of knowledge and ideas. Building owners will continue to allocate more of their space to shared amenities. They will host more events, bringing tenants from different companies together. There will not only be cross-pollination in the office, but cross-pollination in the building. This trend we see in tech companies is becoming mainstream. Building owners who create a collaborative environment with many amenities will be able to attract and retain tenants in greater numbers and more profitable terms. “Hot-Desking” will be more and more prevalent. Hot-desking is the term used to describe when a company has no assigned seating. When employees show up in the morning they can go wherever they’d like. Since most employees are only at their desk on average 60% of the time during work hours, this will help to reduce the amount of unused space. To complement the change in purpose and design, the furnishings must change as well. Furnishing are and will continue to be more of a mixture of office and home furnishings. Offices will be filled with inspiring imagery and messaging rather than bleak walls. Companies will focus more on workstations and “super-desks.” Super-desks are large tables that seat many people. The Barbarian Group, in NY, has created a desk that seats 170 people! 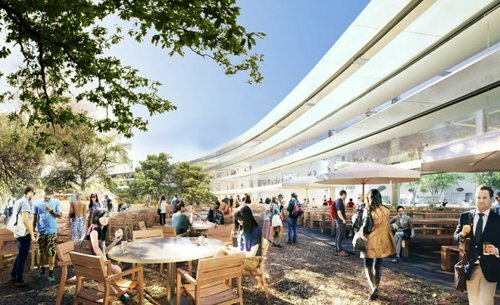 Apple’s new HQ will boast 500 eighteen-foot tables to create an open environment that discourages an office-like atmosphere. Overlap Zones are used to encourage collaboration. Companies will intentionally structure their office so that people inevitably run into each other. Movable furniture will be used to modify where people work based on assignments and team changes. Various studies suggest that a dollar spent on employee health and wellness programs generates a $2.50-$3.50 return. That being the case, more employers will look to create an office that encourages healthy living. Sit-stand desks will become more commonplace. Employers will be looking for more health and fitness options onsite, as well as healthier dining options. Building owners should build the health related amenities these progressive companies are demanding. Apple is going to have 1,000 bikes on site (one for every 13 employees). They are also building a $75 million fitness center as well miles of jogging and cycling trails. Data will fuel the intelligent workplace. Sensors, beacons, and data will be used to tailor-fit the environment for its users while decreasing energy expenditure. Computers and devices will gather data about employee preferences regarding light levels and temperature, and subsequently automate the process of creating that environment. Since Apple is the epitome of a well-run company, and one that is always a trendsetter, we can rest assured the rest of the world will follow suit. 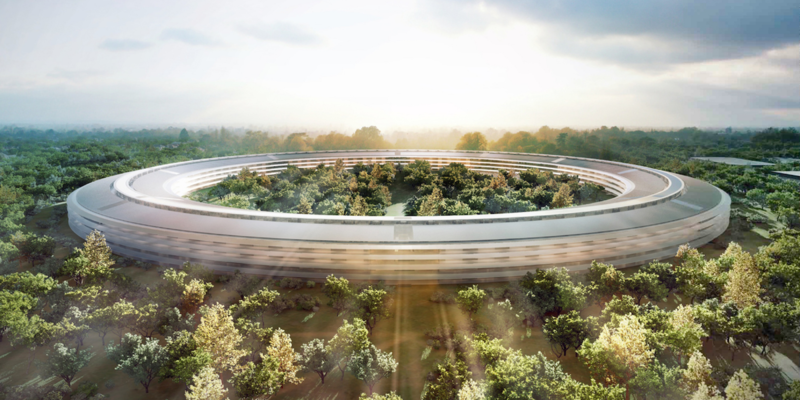 Design your office like Apple and you are on the right track.